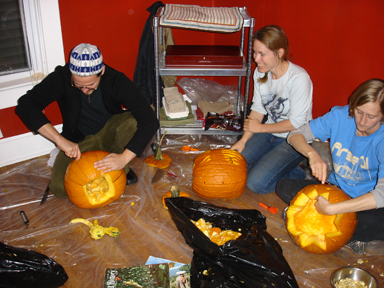 We had our annual pumpking carving party Sunday night, and it was a good time as usual. Many a good pumpkin was carved, and some new tools were even introduced, including a wood-carving chisel set and a eye-gouger/mellon-baller that Richard brought. 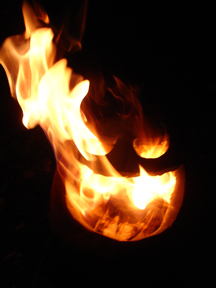 This year my pumpkin was not very intricately carved, this time it was all about the fire. I got the idea from the good people over at www.extremepumpkins.com. They had been working on how to get more fire into a pumpkin when they got an email from a boy scout leader on how to do it. Kids don’t try this at home, it has the potential to be VERY dangerous. I soaked a roll of toilet paper in kerosene overnight, put it in the pumpkin and lit it. It was AWESOME!. The flames didn’t last as long for me as they did for the extremepumpkins.com folks, but I’m going to see if I can get a more dense roll of toilet paper and try again on Halloween. My friend Ben and I are going to try another thing from www.extremepumpkins.com this year too: The Trashcan Costume. Ben and my friend Matt Byam put the thing together at the start of the pumpkin carving party, and it is going to be great! We get over 300 kids in two hours on Halloween in my neighborhood, and some of them are too old or don’t dress up, so we’re going to make them have to work for their candy. I feel like most kids don’t get enough terror in their lives, so we’re actually doing them a favor. The plan is to use three difernet methods to scare the snot out of them. We’ll see how it goes, and I’ll post the results here. Mark Hayward Is My Hero is powered by	WordPress 5.1.1 and delivered to you in 0.352 seconds using 39 queries.